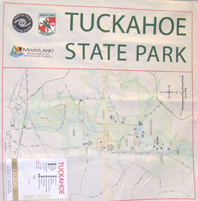 This 100% cotton bandana covers the overall Tuckahoe State Park. Park visitors will find their way through the trails easily and love it to protect themselves from the sun. DNR Bandana maps are 21" X 21" in size and made of 100% cotton.